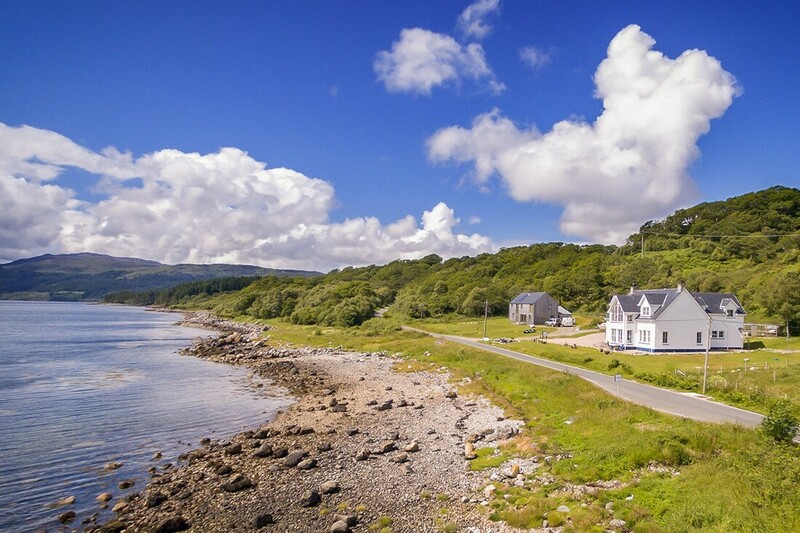 Rockpool House offers self-catering accommodation in an apartment that sits only a few metres from the shore of Loch Sunart at the heart of the beautiful west highland peninsulas of Sunart, Morvern, Moidart, Ardgour and Ardnamurchan. Close to the villages of Strontian, Salen and Acharacle, it is the ideal base for walking, cycling, nature-watching, fishing and touring. The apartment’s west highland coastal setting is blessed with a stunning view south, across the loch, to the mountains and glens beyond. Its design makes the most of this magnificent setting, with a floor to ceiling window facing the loch providing breath-taking views. From there, guests can relax and watch the ever-changing scene unfold before their eyes. Wildlife abounds in the area, with otters, seals, porpoises, eagles and other sea birds spotted regularly from both apartment and the area nearby. The apartment’s one-bedroom arrangement is ideally suited for two adults, but it can accommodate one child of up to 12 years old on a fold out bed. Also, if they wish, guests are welcome to bring one dog to stay with them. To see more of Steven's work, please visit his website at www.smarshall.photography.